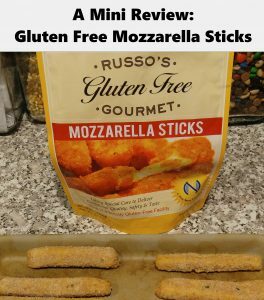 Here’s a quick review of a new item I found on my last trip to the local health food store: Russo’s Gluten Free Gourmet Mozzarella Sticks. The bag contained 11 sticks which I cooked in my convection oven according to the directions on the bag. 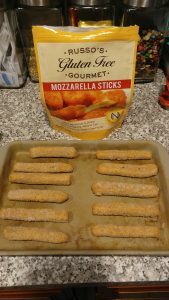 So these mozzarella sticks got mixed reviews with my family. One good thing about them was that, unlike others I have tried, they didn’t fall apart once cooked. The coating stayed crispy and intact. We all agreed that we liked the breading and that while It was plain, we liked that it lacked the overbearing spices that some breaded gluten free products use. We all found that dipped in the marinara sauce we usually use (Francesco Rinaldi Marinara), they weren’t that bad. 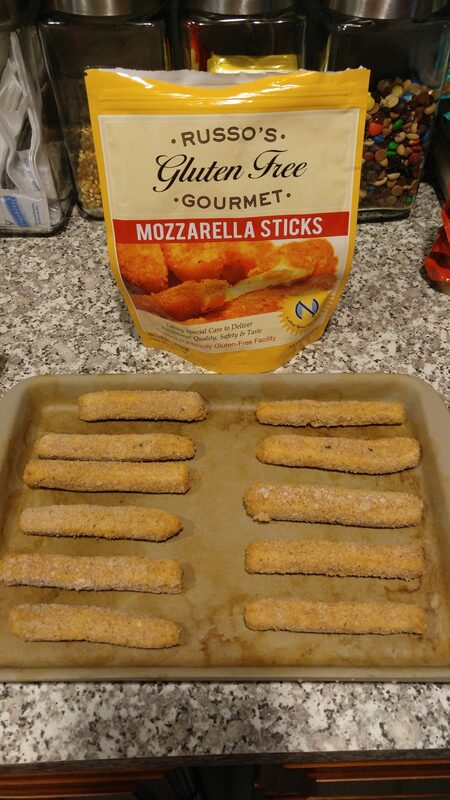 They weren’t great, but they were good enough if you were really craving mozzarella sticks. 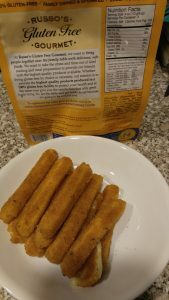 I will probably buy these again but only if someone actually asks for mozzarella sticks specifically. I don’t see myself using them for a party (unless the birthday child requests them) and I definitely won’t serve them to people who eat gluten. They just taste a bit too different. I’m sure that frying them in oil would make them taste a little better. However, we try to eat healthy here and It’s just not worth all the mess that comes with frying. For more mini reviews checkout our product review page.